We are on week four since My Name of Jake was released and it has been an amazing start! 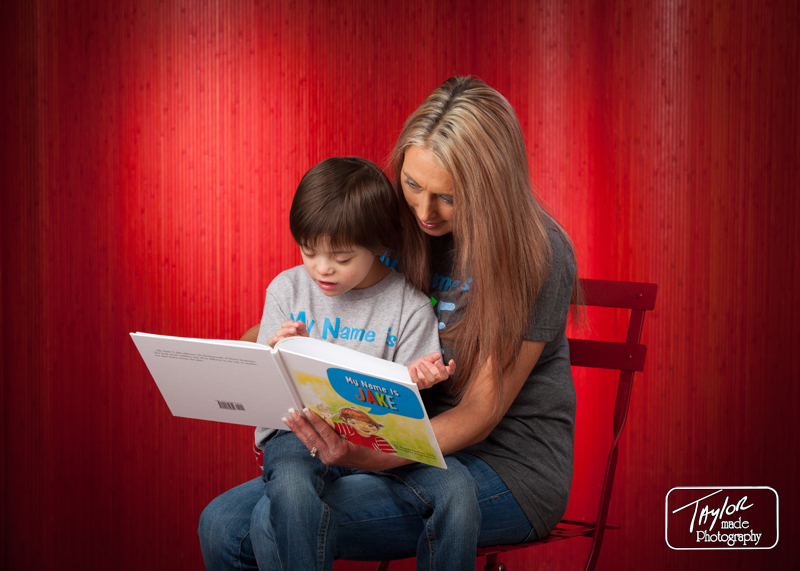 We hope to teach kids across the world WE ARE MORE ALIKE THAN WE ARE DIFFERENT and help them realize that children with disabilites are just like them! Jake has enjoyed our book signings! He signs books with his thumb print and loves meeting new people. It has been such a joy to meet so many of you and feel the love for our boy. Thank you! Please help us spread the word about My Name is Jake. Tell your family, your friends and your schools about it and feel free to share this website and Facebook Page https://www.facebook.com/MyNameIsJakeBook. Jake’s Pre-K Teacher shared a message with Clever Classrooms and they shared her message with their followers! 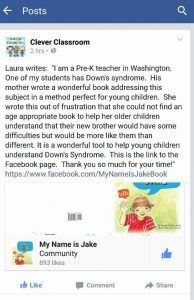 Thank you Laura for helping us tell others about MY NAME IS JAKE! ← Get your copy of My Name is Jake!